A road trip from Alice Springs to Adelaide is arguably the second best Aussie road trip ever! The Stuart Highway south from the Northern Territory into South Australia is one of those quintessential travel experiences that everyone should have! Miles and miles of desolate open landscape, stark scenery, broken fences, vivid red sand dunes and signs of the drought stricken outback everywhere. Even so, there’s always a sense of excitement when travelling south. Despite being in the middle of the desert, Alice Springs has lush green ‘oasis’ feel about it. Alice has a number accommodation choices with several camping grounds, caravan parks, hotels and great little restaurants. The infamous Todd River flows right through the middle of town and for most of the year it is a dry riverbed. When it does rain though, it becomes a major attraction for locals to ‘watch the Todd come down’. The Stuart Highway stretches from Darwin to Adelaide and passes a number of spectacular landmarks that you ‘must’ include on your trip. One of the most striking places I’ve ever been to is Rainbow Valley 75 kilometres south of Alice Springs and the most spectacular in the early morning or late afternoon light. The impressive sandstone rock structure changes from ochre red to orange and deep purples. Millions of years of wind and rain erosion have sculpted this bluff which is a significant and sacred site for the Arrernte clan of Central Australia. If you’re lucky enough to visit when it rains you will be rewarded by the extraordinary colours and the reflections in the claypans at the base. Rainbow Valley is best accessed with a four-wheel drive vehicle and is a great place to camp overnight. Henbury Meteorites Conservation Reserve contains 12 craters which were formed when a meteor hit the earth’s surface 4,700 years ago. The Henbury Meteor, weighing several tonnes and accelerating to over 40,000 km per hour, disintegrated before impact and the fragments formed the craters. The craters are fascinating and providing natural, cultural and scientific value and well worth visiting. Two-wheel drive access is available. About 160 kilometres from Alice Springs on the road through to the Simpsons Desert plains, Chambers Pillar stands tall as a spectacular sandstone column towering some 50 metres above ground. Access is via four-wheel drive tracks. Camping is permitted but you must bring your own firewood. Guided Ranger talks are held May to September. Be sure to stop and refuel as you get the opportunity as it’s a long journey. Stuarts Well Roadhouse and Erldunda Roadhouse have fuel, food and accommodation options available. Erldunda Roadhouse marks the intersection of the Lassiters Highway — the road to Uluru (Ayres Rock), Kata Tjuta (the Olgas), Kings Canyon and Mount Conner. Make sure these destinations are on your Territory bucket list. Kulgara and Marla Roadhouses are other opportunities to take a break as you head further south. All have food and accommodation available. Coober Pedy is a quirky town with a population of 3,500 where more than half the town’s families live underground. Known as the Opal capital of the world, Coober Pedy is quite possibly the most unique town in Australia! There’s lots to see and do in Coober Pedy. For something different, try your hand at ‘noodling’! ‘Noodling’ is the name for fossicking for opals! Play a round of night golf on the only ‘grassless’ course in Australia. Local tours offer tours of a ‘dugout’ home (some are more like mansions), underground churches, 4 star hotels and art galleries and there are self-guided tours through the historic Old Timers Mine, hand dug in 1916. Stay overnight at one of the ‘underground’ hotels. You’ll be surprised how soundly you sleep! Glendambo is always our ‘breakfast’ stop when driving south, great roadhouse style breakfasts and friendly service. Pimba is the next stop and is the gateway to Roxby Downs (mining town) & Woomera (remembered for it’s nuclear tests in the 1940’s). The Stuart highway passes along the edge of Lake Hart around 700 kilometres north of Adelaide. It is an extraordinary oasis in the harsh South Australian outback and has a catchment area stretching into South Australia, the Northern Territory and Queensland. When the lake floods, it creates a stunning natural vision. Huge numbers of waterbirds flock to the lake and the usually stark landscape comes alive with the rich colours of native wildflowers, indigenous to the area. As the lake dries up and the water evaporates, its salinity increases and it often appears to turn pink. When empty, the lake becomes a giant salt pan, with white crystals reflecting the sunlight. The vast open spaces of the Flinders Ranges are certainly impressive. This mountain range stretches along the Birdsville Track and the Oodnadatta Track along the edge of the Simpson Desert, both historical journeys of our pioneer days. Climb the amazing rock formation at Wilpena Pound. Wildflowers are abundant in the spring and the colours of the ranges will take your breath away. A sleepy little town 3 hours north of Adelaide and the crossroads to Western Australia. The perfect opportunity to take a break and a chance to refuel, refresh and relax with plenty of accommodation options and great pub meals. The home of renewable energy sources for South Australia feeding into the National Grid. Port Augusta region has replaced coal power generation with solar and wind farms. Heading south from Port Augusta, turn off at Horricks Pass across the iconic Flinders Ranges to take the scenic route through the Clare Valley wine region. It’s a great opportunity to get off the main highway and explore some lovely boutique wineries, bed and breakfasts and exceptional restaurants. Adelaide is known as the city of churches! It enjoys a great art scene and a melting-pot of cultures forged from european migrants from the ‘great depression’ era. Adelaide has an wonderful array of cuisine styles, an abundance of fresh seafood and waiters with an extraordinary knowledge of food & wine matching! A short drive will take you to the Barossa Valley, McLaren Vale, Adelaide Hills and Coonawarra wine regions for some of the best selections of wines in Australia. Have you read our previous post? 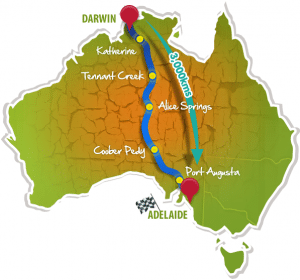 An Aussie Road Trip – Darwin to Alice Springs!